There are a number of things that you will thoroughly enjoy as an owner of this Agena "StarGuider" 8-24mm 1.25” zoom eyepiece which is specifically designed for both visual and photographic use. 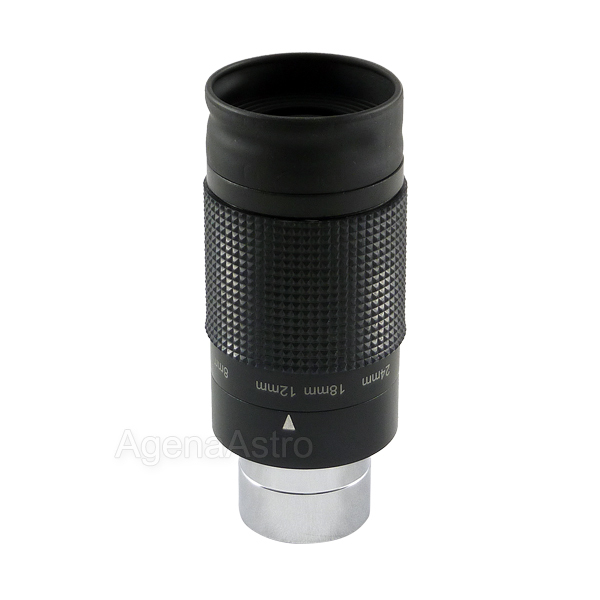 This high quality 8 to 24mm range zoom eyepiece comes well equipped to suit the demands and ease of use of the amateur astronomer. Equipped with a generous 40° to 60° field of view and a non-click stop adjustment mechanism, this eyepiece allows smooth transitioning between focal lengths, ensuring that the observer can find the perfect combination of field of view and magnification that the target object and seeing conditions will allow. Eyeglass wearers will also find that this eyepiece’s long 15mm to 18mm eye relief combined with a flip down rubber eye guard ensures that even they can easily take advantage of the many benefits provided by this eyepiece’s high quality multi-coated optics and zoom capability. The single feature that sets this zoom eyepiece above all others is its unique adaptability for eyepiece projection photography. The eyepiece is threaded at the top for a T-adapter (standard M42x0.75 male thread) and at the bottom for 1.25” filters (standard M28.5x0.6 female thread), enabling owners of any T-thread mountable camera to photograph the planets, the moon and high powered terrestrial targets at broad range of focal lengths! In addition to your D/SLR camera, you will require a T-ring for your camera (not included) to use this feature. Featuring a multi-coated optical design, this eyepiece will be providing high contrast views and unparalleled ease of use whether it be for photography or visual observing, for years to come. 4.4 (Based on 17 Reviews) 94% of reviewers recommended this product. This is a nice zoom as a grab & go. It's labeled star guider. I've only used it to look at the moon & Saturn it produced very nice views on par with my plossel eyepieces. Price was right as well. This is a great eye piece at a reasonable price. Good for working with a smaller telescope. Shipping was quick. I ordered 8 zoom eyepieces for our library scope program and they were delivered promptly and in good order. These eyepieces were exactly what we needed. 5.0 Great tool for the money. Well made, better than I expected. As for the optics, better than I expected from a zoom. A good value for a zoom EP. My main purpose was to use the T-threads connect to a camera and take photos with a Coronado PST. I have not been able to achieve focus by any other means. This EP works great! Like another reviewer mentioned it could not focus at 24mm end with the PST (as a regular EP it could focus) but this is OK. This is a great well built EP. The t -threads are an added bonus for eyepiece projection photography. Agena AstroProducts is a great vendor. They shipped quickly and it was free. They have lots of good stuff. For the price, I don't see how you can beat it. It's built solid, optics a great (for the price range) and comes with a nice plastic carrying tube to protect it. The rotation is smooth and good eye relief. Labeled "Starguider". Some minor refocusing required after zooming. 4.0 Works great with Coronada PST!!! I had a problem being able to focus my DSLR on the PST. This solved that problem. I can ALMOST get focus at 24mm, but can get good focus on the other fl. I use it mainly at 12mm to 18mm. I gave it 4 stars because as you adjust from one fl to another, you must re-focus. My zoom eyepiece arrived on time and in good condition. It is so easy to use. I haven't tried my camera yet, but I will. 5 stars reserved for excellent customer service which was not necessary. Review by bnsteel of Raleigh, NC. I use this zoom eyepiece on my 8" Dobsonian telescope and it is the only eyepiece that I use. I really like the fact that I can change power without fumbling with parts in the dark when my hands are cold. I am a beginner and have not looked through the high dollar eyepieces, but I have seen some fantastic views! Before I got this, I would use lower power eyepieces to find an object and then swap out to higher powers - and in this time the object would no longer be centered and I would have a difficult time finding it again. I am very happy with my purchase. One thing to note is that the is a big, heavy eyepiece and you will need to adjust the balance of your telescope. It is about 3" long. I wouldn't use a Barlow with this as it would make it even bigger and heavier. Review by Jeremiah2229 of Illinois, USA. I purchased the Baader Mark-III Zoom from Agena but it has dust inside it, working to resolve this now, and needed a zoom for photography that has no dust. As soon as this arrived I inspected and proceded to attach to scope via the built in T-Threads to camera. The zoom is a little stiff but this is good as the camera will not rotate when attached. The Baader is not stiff and it will definitely rotate (zoom) while a camera is attached. This zoom makes a grinding noise, don't know how best to describe it, when zooming. Doesn't seem to affect anything and the zoom is parfocal from 24-8. I quickly snapped off some pictures of hummingbirds, flowers and other critters about 100 yards away. Have to say that this initial test was good and I am happy with it. Views of objects about a mile away came into focus fine and were crisp. Of course there is a small amount of light loss when going to higher magnification. Hope to take out tonight for testing and see how it does in some more of my scopes. Daytime images were crisp to the edge and hope this will be true also for night time use. Quite happy so far too as this zoom is not as bulky as the Baader Mark-III and balancing is a breeze. The T-Threads are perfect for those that want to attach a camera. Sometimes I think all eyepieces should just add the T-Threads to the top. Perhaps that makes sense though? Review by forrestranger of San Diego, CA. I quite like this eyepiece. I was showing the grandkids the moon and planets starting with fixed focal length eyepieces. The real fun started when they could zoom in on details themselves. Someday I'll get the Baader Hyperion Zoom but until then this is less than 1/4th the price and works well. Review by Morgan of East Texas. For the price you cant beat it. Much easier than switching between several eyepieces. Review by nanomole of CA. Review by Mike of Tasmania. Not the best one on the market but good enough for just general visual use. Very convenient for looking at the moon and planets without having to constantly swap eyepieces to change magnification. Image quality maintained well when zoomed in. Review by Stargazer1 of Chatsworth, California. I love this zoom eyepiece. The eyepiece is easy to use. The optics are great. I have let my friends try it out, and they are as impressed as I am with the quality and ease of use of this eyepiece. I have not found one negative thing to say about this product. Review by Carl D. of Upper Peninsula, MI. I own the Baader Hypreion zoom which I dearly love. But I wanted something lighter/cheaper for my smaller telescopes and travels. I picked up this eyepiece and couldn't be happier. It would be very unfair to compare this eyepiece to the Baader and Williams Optics zooms costing 4x more. But for the price, this is a great deal - thats the important thing to keep in mind. It offers very good quality views in my spotting scopes and travel scopes (80mm short tube and a 150mm reflector), both for a wide range of celetial and terrestial targets. Zoom action is very smooth and I love the convenience of covering the entire useful range of 8 to 24 mm with one eyepiece. The FOV, while naturally smaller than wide angle eyepieces, is par for this type of product. I also love the fact that I can hook this up directly to my camera + t ring without any extra adapters. I also own the Celestron zoom and think (but cannot say for sure ofcourse) that this is the same exact product. To me they look absolutely identical - the views, the design, the coatings, even the plastic container with inscriptions. The only diff is that the celestron EP has their brand on the EP and the box. I paid about $15 more for my Celestron zoom a few months ago. All in all, I am very happy with this product at this price point and for my needs. The fact that it matches my other branded zoom is even sweeter since I'll be able to use these in binoviewers soon. Review by Astro-Creep of Homosassa, Florida. I bought two of these to use in my Orion Binoviewer. They are hard to get just the right amount of focus unless you use one eye at a time, but does focus the best it can though it seems to never get a sharp focus no matter what scope I use it in. The zoom action is smooth but also seems to move on its own, remember I have two of these so if it were just one I would say its a fluke but it has to be the design? Next is the T threads on top under the eye cup, when I screw on my Meade DSI camera to use it, I am able to get it to focus but still not sharp. I don't think these are for sharp images? I bought the [$] buck zooms because the $45 dollar zooms had a low FOV. So I got the next step up and I cant say how well the cheaper zooms are but if the higher zooms are this bad then I would hate the cheaper ones! Also when the T thead on top unscrewed there is oil inside the housing and some how I got that oil/grease on the lens. I finally removed the grease and it's clear again.If you need to use filters, the way this ep is built its either not going to screw on because of only 2 threads available or you might get it to screw on because of the very short threads. "So the good", it's light weight, not too bad on cost, has a good tan color screw case, not too bad quailty but needs to be better because it wont focus sharp. "The bad", the view using the 24mm had a small window, about the size of a nickel, the 8mm has the size of a quarter, I think the sharpness in the image is best using lower powers with this zoom, the price is not that bad but you can search around on the nest and maybe get a [...] zoom at [$]. Oil can get on the inner lens if the T thread housing unscrews, they should have glued this ring down, I wont return them because they do a pretty good job on Nebula, and planets but since you can't really use a filter I wouldn't expect the best detail on planets. The moon is great with these but I think a finder scope is also great when looking at the moon. I'm sure I'm missing something in this review but the best way to find out is get just one and see how it works. I have 4 different scopes, Meade 8" LX90, Orion 8" F/4.9, Orion 120 F/8.3 and a Orion 130 ST F/5 and all of these scopes can't be bad?? My Meade Super Plossls are very sharp and provide a great view, I just didn't want to use so many ep's so I wanted to try this zoom.